This mod adds 338 new NPC. Fixed the Ignore Diamond City Location script. Large group settings will support DLC. Automatoron's Mech Bot, Rust Devil. 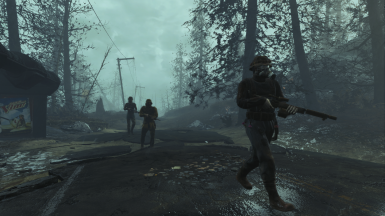 Far Harbor's Trappers, Feral ghoul, Super mutant. Nuka-World's Gunners. Fixed the large group NPC package. Fixed that Mech Bot and Rust Devil patrol were not included in the Ignore Diamond City Location setting. Tweaked the encounter with the synth patrol. Large group settings will support feral ghoul (Daytime: 16 to 23, Nighttime: 20 to 27) and Super Mutant (14 to 19). Fixed that the second and third raider group had power armor raider. Added the Large Group setting to config menu. Large Group has 14-20 enemies. This is only the Commonwealth Raiders and Gunners for now. Default is disable (0% chance). 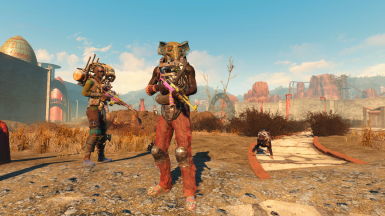 Fixed that after raider group leader dead, the power armor raider appear there if enabling setting. The DLC settings can be set without waiting for unlock condition. Added the Fast Respawn setting to config menu. When a leader of a hostile group dies, the group will be reset within 1 to 2 days. Including BoS, Minuteman, Synth patrol. Default is disable. Added "[ ] Power Armor" to Raiders setting. If this setting is [X]. A fifth member appear who equipped with a power armor. Default is disable. Added NPC to the Nuka-World. 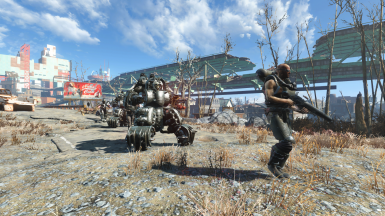 Raiders patrol will no longer be equipped with power armor. Added the Ignore Diamond City Location setting to config menu. A hostile NPC will not appear around the Diamond City. Including BoS, Minuteman, Synth patrol. Default is disable. 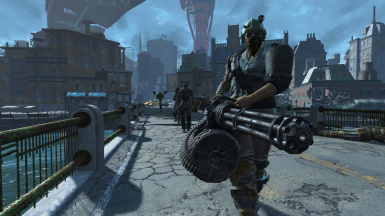 Note: This condition is that Diamond City area is loaded first. The script such as maintenance finishes a little earlier than before. Fixed and simplified the holotape renaming. There were twice Spectacle Island crash reports and I had no idea why my mod is the cause. For this reason, to avoid unknown CTD problem, the editing of the Spectacle Island returned to Vanilla. NPC will never go to the island. Minuteman patrols unlock conditions are not changed. Added the No DLC version to optional files. This file can be updated to latest version of main files after installing 3 DLCs: Automatoron, Far Harbor, Nuka-world. Since the old files 1.5.2 that was deleted cannot update to the latest version, it tended to be troublesome. Actors script, fill of properties. I forgot to fill it. Moved the 3 marker of Far Harbor outside the place of settlements. I just forgot to do it. Added settings of settlements visit to config menu. Version 2.0.0 requires Automatoron, Far Harbor, Nuka-world. Added Mech Bot and Rust Devil patrol. Added three kinds of wandering robots. Added Super Mutant Suicider. They follow behemoth. Tweaked the Feral ghoul behavior. Fixed the mod does not start even when after the making a holotape. Fixed the feral ghouls groups will sometimes despawn in combat. This is not a perfect fix, but there is no problem if this happens. Added 3 Group of Feral ghoul. Added 3 Behemoth. Unlocked after kill five giant creatures. Giant creatures are super mutant behemoths and mirelurk queens. Config menu: Added indication of whether or not the Minuteman/BoS/Synth/Behemoth is unlocked. Fixed a small mistake in the script. This does not cause any problems. The holotape will be able to rename to "[Settings] NPC Travel" to be compatible with Valdacil's Item Sorting. The holotape will be able to craft at the chemistry station. Adventurer and scavenger would no longer use the bed because they were using the bed in settlements. Adventurer and scavenger might have a stealth boy with a very low probability. Thanks to passinthrough. In survival mode, mercenary doctors might be dealing with antibiotics and herbs. I had forgotten. Fixed the automatically aggressive AI data of synth patrols. Minor tweaks and fixes, etc..
Added new 3 Synth patrols, 3 Deathclaw, 3 Yao Guai. Added 1 Minuteman patrols, 1 Brotherhood of Steel patrols, 1 Gunners squads, 1 Group of Raiders, 1 Group of Super mutant. Added more face variations. 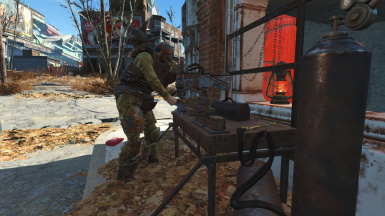 Maybe, new settler and minutemen seems to have been added in the official update. If not so, i forgot to that. Changed the Minuteman patrols description that "Unlocked the first minutemen patrol if the over 6 (before 10) settlements and the castle has been owned by player. The second is 12(before 20). The third is 18. Except DLC." 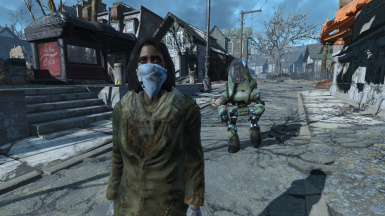 Changed the default number of BoS and Minutemen to 1 from 2. This change does not matter to the save game. Solved the problem that the [NPCs Travel Config] was not be added to player if using "Alternate Start - Infinite Answer" mod. Abolished the [NPCs Travel Config] automatic add to players inventory when player does not have after mod start. I rely on machine translation because I am not good at english. Travel extensively and encounter in various places. Travel destinations are determined randomly. Travel destinations is more than 400 places. Some travel destinations are unlocked by quest achievement or specific conditions. Hunter will travel with a dog and sell items obtained by hunting, such as animal meat. Scavenger will travel with a robot and sell mainly junk items. - Members: Leader, Doctor, Mercenary, Robot. Default 1. Mercenary doctor is a doctor and dealing with medical supplies. - Members: Leader, Minuteman, Minuteman, Dog or Eyebot. Default is 1. Unlocked the first minutemen patrol if the over 6 settlements and the castle has been owned by player. The second is 12. The third is 18. Except DLC. - Members: Leader, BoS, BoS or Dog, Mr Gutsy. Default 1. 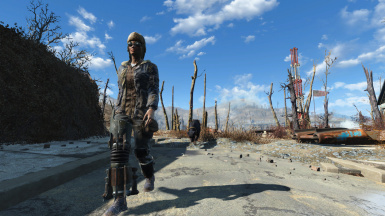 Unlocked after the brotherhood of steel arrives in the commonwealth. - Members: Leader, Synth, Synth, Synth. Default 1. Unlocked after completing the "Unlikely Valentine" or "Road to Freedom" or "Call to Arms" quest. - Members: Leader, Gunner, Gunner, Robot. Default 0. - Members: Leader, Raider, Raider, Attack Dog. Default 0. - Members: Leader, Super mutant, Super mutant, Mutant Hound. Default 0. - Daytime: 6 to 8, Nighttime: 10 to 12. Default 0. 3 Deathclaw and 3 Yao guai. Default both 0. They sleeps by day and hunts by night. - Members: Behemoth, Super Mutant Suicider, Super Mutant Suicider. Default 0. Unlocked after kill five giant creatures. This is the same condition as achievement "...The Harder They Fall". Robot. Default is all disable. All NPC will affected by the [iHoursToRespawnCell, iDaysToRespawnVendor] of game settings. In addition, all NPC will reset after a elapse of 10 days. The timing is players sleep. The mod start after the escape from vault 111. Unlocked after rescued the robot with "Mechanical Menace" quest. - Members: Leader, Mech Bot, Mech Bot, Mech Bot, Mech Bot. Default 0. - Members: Leader, Rust Devil, Robot, Robot, Robot. Default 0. Unlocked after the Walk in the Park quest's "Defend the Hull". - Members: Leader, Harbormen, Harbormen. Default 1. Unlocked after the Echo Lake Lumber is owned by player. - Members: Leader, CoA, CoA. Default 1. Unlocked after player joined Church of the Children of Atom. - Members: Leader, Trapper, Trapper, Trapper. Default 0. - Random: 2 to 5. Default 0. 2 Fog Crawler. Default 0. They usually stick to the deep fog. Unlocked after completing the "Taken For A Ride" quest. - Members: Leader, Disciple, Disciple. Default 0. - Members: Leader, Operator, Operator. Default 0. - Members: Leader, Pack, Pack Dog. Default 0. Unlocked after completing the "Open Season" quest. - Members: Leader, Minuteman, Minuteman, Dog or Eyebot. Default 0. Requirement: The castle has been owned by player. - Members: Leader, BoS, BoS, Mr Gutsy. Default 0. 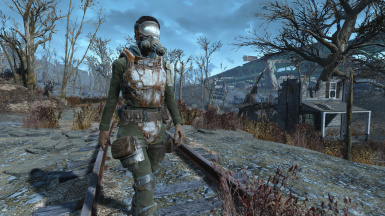 Requirement: The brotherhood of steel arrives in the commonwealth. - Members: Leader, Synth, Synth, Synth. Default 0. Requirement: Completing the "Unlikely Valentine" or "Road to Freedom" or "Call to Arms" quest. The [NPCs Travel Config] is holotape that will be automatically add to inventory after the mod start. If holotape is not added for some reason, please craft it at the chemistry station. Then the mod will start in real time within one minute.